The introduction of legislation to reduce energy consumption and CO2 emissions has changed the heating industry significantly. For a start, it has encouraged manufacturers to develop highly energy efficient products. But that is only looking at part of the solution. Taking commercial boilers as an example, simply installing the equipment will not reap the advertised benefits. It is necessary to take the wider system into account, with the heating circuit under scrutiny. To achieve maximum energy savings and efficiency, it is essential to optimise use of boiler controls and sensor technology. These will not only ensure comfort levels are maintained but also the wellbeing of occupants and productivity of staff, when talking about an office environment. Consequently, maximising the use of control technology has benefits beyond heating costs. 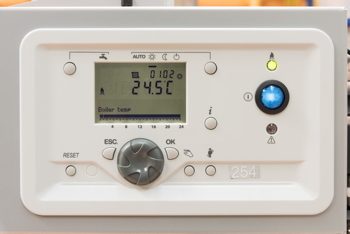 Modern boiler controls can do several jobs at once. They can optimise the heat output of heat generators, heating circuits, and heating control. However, lack of knowledge on the user’s, or indeed the installer’s, side means they are often not used to their full advantage. There are lots of factors to consider when setting them up. For one, the thermal inertia (how quickly the space responds to heat input) of the building needs to be taken into account. We would find low thermal intertia in an office with low ceilings, for example. Low thermal inertia means the space will heat up quicker and reduces the required start time before occupants arrive. High thermal inertia, such as we might find in a church, where a lot more space and air are present, will increase the required heat up time dramatically. High ceilings go hand in hand with poor air distribution and hence poor heat distribution - unless suitable equipment to solve this issue is installed. 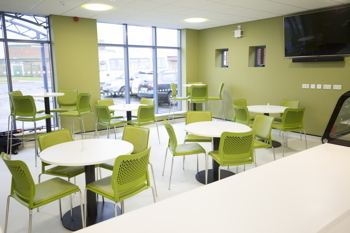 Abbey Hill Academy bistro, a good example of a space that experiences varying levels of occupancy and which benefits from the application of controls. Different types of building meant that it is vital to calculate the correct time to switch on the boilers in the morning. On the other hand, an early switch-off, before occupants leave, can help to achieve crucial energy savings. Some modern controls can self-learn these timings when set up correctly, although fine tuning is still necessary and recommended throughout the first year of occupation. Buildings do not demand the same amount of heat in every part of the building. Corridors require less as they are only used sporadically. Kitchens, as another example, benefit from heat generated through the use of ovens and hobs, making their requirements lower. To cater to those needs, it is necessary to divide a building’s different parts into heating zones to avoid heating empty or low-use areas. This effectively minimises required energy and therefore costs to warm the building - heat is provided when it is needed, where it is needed, and at the right intensity. One of the factors outside a building which has an effect on heating behaviour is heat loss. It occurs on surfaces which make up the building envelope which separates a building from the outside (such as walls, floors, roof, windows etc.) but also from gaps where cold air enters. Especially in the winter months with low temperature and winds, this can have considerable influence. Therefore, it is necessary to monitor the external temperature at any given time to estimate the heat loss from the building. However, internal space temperature sensors are equally important. These should be positioned in carefully selected locations away from direct sunlight or other factors that affect measurements. They not only monitor the performance of the heat generators and the various heating circuits, but they can also track “free contributions”. This can be solar radiation, especially where glass is present; heat generated from the occupants; and by internal processes, such as cooking, internal lighting, IT equipment such as servers and computers. The hot water requirement is another factor which greatly influences how energy is consumed within a building, especially where canteens and showers are present. For lower hot water requirements such as in smaller commercial kitchens, direct fired water heaters are often not a feasible solution due to associated costs. However, a boiler with advanced built-in controls benefiting from a hot water priority setting combined with a calorifier with fast recovery time is a viable alternative. One of those scenarios would be a kitchen coupled with an underfloor heating circuit. Whereas the hot water requires the boiler to operate at 80°C, the underfloor heating circuit can only take an operation temperature of a maximum 50°C to prevent structural floor damage. With relatively little hot water demand, the already-stored water only needs to be topped up, which takes a few minutes at a time. With a hot water priority setting, the boiler knows when hot water is required and shuts down the heating circuit whenever it operates at 80°C to rule out damage from high temperatures. Once the excess heat has been distributed around the hot water system, normal heating operation is resumed. Rather than constantly running the boiler at 80°C in less efficient non-condensing mode, it is only doing so when required, reducing energy consumption. Close control of the heating equipment only comes to fruition when a wide range of factors is considered and catered to: outside temperature, heat loss, free contributors and other requirements such as hot water. Along with enhanced insulation to prevent heat losses, this contributes to a major reduction of carbon emissions and energy costs.